Nadi Astrology is a spiritual tool to unravel the mysteries of past, present and the future. Divine secrets of past, present and future of each soul, were etched in the Agastya Nadi leaves through yogic mystical power of Sage Agastya. Souls seek the relief through the leaves when laden with troubles due to the effects of previous bad karma. 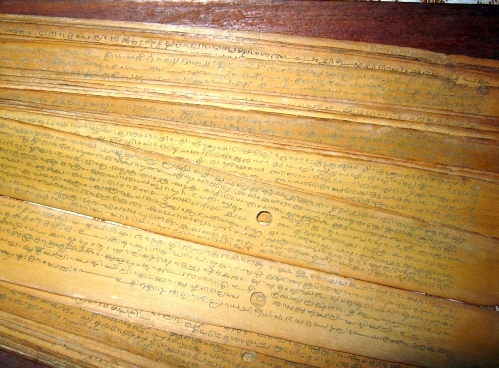 The Agastya Nadi Reading gives instruction to the soul through the nadi leaf reading. The Agastya Nadi Reading will advice the soul (you) to seek the remedies as atonement of past errors and afflictions brought from past lives from the nadi leaf reading and reveal the divine secret to increase the number of virtuous actions in order to experience great changes in life. Given proper motivation from the Agastya Nadi Reading, the Soul (YOU) are given the path to restoring righteousness, and the Soul would avoid committing wrong and evil actions in future. If it is destined, the soul would seek a remedy through a nadi leaf reading. A nadi leaf shows the entire role of every soul from the beginning of time. No leaf which belongs to one person will match anyone else’s leaf. Each individual will have only one leaf. Agastya Nadi Astrology was written in ancient Tamil on palm leaves by the Sage Agastya out of immense compassion for mankind. The Nadi Leaf Reading will tell about Your Name, Parents, Brothers & Sister, Spouse & Children, Occupation and list of future prediction all the 12 houses. The Nadi Leaf Reading will tell about your Family, Health, Education, Money and Power of Perception. The Nadi Leaf Reading will tell about Mother and Properties, Possessions, Vehicle and other comforting contentments. The Nadi Leaf Reading will tell about about Birth and life of Children, Benefits and indications if you do not have children. The Nadi Leaf Reading will tell about your Health, and critical times to take care of health. It will mention risk of poor health to your body, your debts, legal proceedings against you in the court of Law, people who are not favourable to you, the troubles they may cause and remedies to overcome these. You will also receive guidance for remedies to maintain optimum health. The Nadi Leaf Reading will tell about the time of Marriage, reasons for late marriage, relations with spouse and spouse family in married life and relationships with other persons in important activities. The Nadi Leaf Reading will tell about your life span, major influences in your life, including propensity for accidents and dangers. The Nadi Leaf Reading will tell about your Father, his Wealth, your luck, your sacred activities, charitable deeds and meetings with and blessings from Holy people.